Thomas Montgomery, an award-winning winemaker and Fresno State alumnus, is the Fresno State Winery’s new winemaker. The Sanger native, who honed a reputation for award-winning Cabernet Sauvignon, Chardonnay and Bordeaux varieties as a winemaker for well-known wineries in Napa Valley and Sonoma Valley, began his Fresno State assignment July 31. 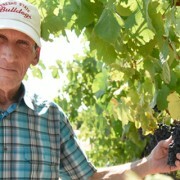 His career began at E&J Gallo Winery in Fresno and at United Vintners in Reedley upon graduation from Fresno State in 1979.